When you start off by saying that you are going on a weeklong trip, Madison, Wis., is about the last place anyone would expect as your destination. 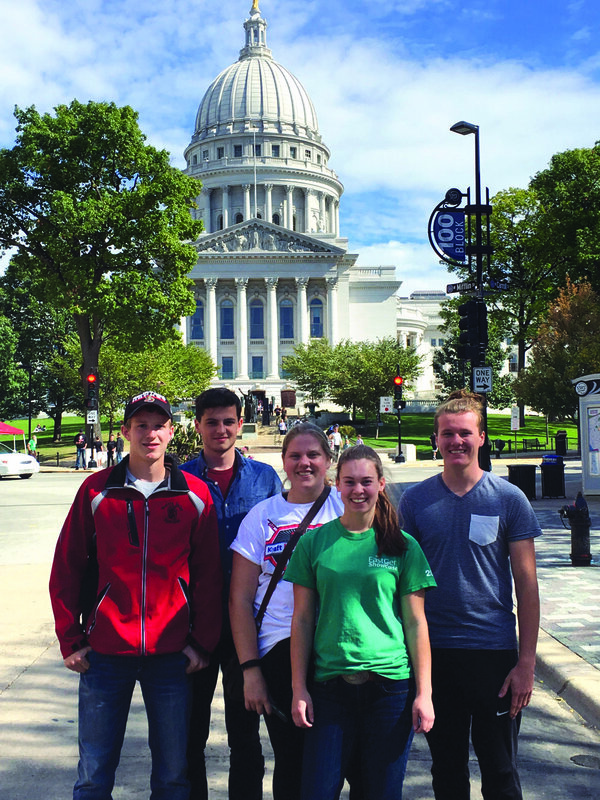 But for a young farmer, what better place is there to spend the first week of October than in Wisconsin at the National 4-H Dairy Conference and the World Dairy Expo? There are many things that can be taken home from any 4-H experience. But the adventure, my first time across the border, and the friendships made along the way are sure to be experiences I will never forget about this trip. My adventure started off with some very good planning – planning to be well rested so I would be ready to be at the airport at 4 a.m. on Oct. 1. After meeting Grace Hughes, my fellow P.E.I. delegate, at the airport, we spent our time waiting to board the plane the Islander way. That is, we sat back and talked to the people next to us, answered their questions about how the whole dairy farming thing works and explained who our fathers are all while enjoying our last taste of ADL chocolate milk for the week. Two planes, U.S. customs, and four more Canadians (Brogan Keenan, Adrian Bent, Reilly Riordon, and chaperone John Riordon) later, we had arrived in Madison, and Nova Scotia delegate Adrian was already admiring the not-so-fashionable cheese hats. Arriving at the Lowell Center, with our bags stashed in the back room, we sat down to receive probably the best advice you could give five mostly responsible teenagers. Our chaperone John, in addition to giving us a life lesson, told us to “be safe and whatever you do don’t get caught.” That may have got a laugh out of us, but he told us he could already see we wouldn’t cause him any trouble and he wouldn’t want any other group to chaperone. We had arrived early, so we decided to do some exploring. We accidentally wandered through a festival that was all about promoting the use of natural products, toured the Capitol building, and took in the sights at Law Park. After we made our way back and got checked in, Reilly, Grace, Brogan, Adrian, and I all piled downstairs where we were introduced to everyone we would need to know for the next five days, one of whom was Barry, our fun activity coordinator. And that he was. Every night after supper, Barry would teach us a new dance that would help us get to know everyone at the conference. Unfortunately, I think those moves will be staying in Wisconsin. We went on a lot of adventures throughout the week, including touring around the Nasco store, Crave Brothers, the ABS Global Inc. bovine genetics facility, and all the farms that welcomed us in to see how their operations work. We were also welcomed by the University of Wisconsin-Madison to take part in many different workshops, including an udder dissection. When explaining Nasco, I say it was like an agriculture Costco, because they had everything from cattle sprays to frogs. Touring Crave Brothers was a cool experience. Coming from P.E.I., nothing compares to seeing a farm with 2,100 head to supply the Crave Brothers cheese, ice cream, and milk bottling facility. Growing up as a farm kid, you soon realize that other children just don’t have the same level of excitement as you do for certain experiences. Touring ABS and taking part in an udder dissection fall into this category. Each adventure we took part in had something new to offer. Nothing compares to the World Dairy Expo, which features pavilion after pavilion of the world’s finest cattle. We got to see Nova Scotia-bred Musquie Iatola Martha named Grand Champion Jersey for the third consecutive year. It was a cool experience to say that we now knew some of the people in the show rings and we were able to cheer them on, including fellow 4-Hers from the conference and friends we made in the barn. Savanna and Kolton from Quebec took home first in senior and junior showmanship. Not bad for a couple of young Canadians. We spent days touring around and trying to take in as much of the shows as we could. We still didn’t see everything but we did stop to try the famous grilled cheese. We were known as “the Canadians” for the week. It was funny to see the looks of confusion when people would ask us where we were from and we would respond with our home provinces of P.E.I., Nova Scotia, New Brunswick, and Quebec. We quickly learned to just say “Canada” and pretty soon everyone knew who the Canadians were. It was interesting to see the differences between the way we run things here in Canada compared to the U.S. Grace and I wore our ADL (Amalgamated Dairy Ltd.) coats, and people asked us what ADL was. Many were surprised to find out that it’s producer owned and it’s where we ship all of our milk. There were many stages of saying goodbye because we all left at different times. It’s hard to believe that it’s so difficult to say goodbye to people you met only a week previously and to some you may never see again. Over the course of my trip, there were many life lessons to be had and a lot of great advice passed along. I can now say that I have friends not only from different parts of Canada but also from all over the United States. When listening to multiple speakers each day, it is impossible to remember every single piece of advice. But there was one speaker whose insights really stuck with me. He said that after this trip, we would be expected to go back to our old lives, but that this would be impossible because we would not be the same people we were a week earlier. Some things will be left in Madison, including some inside jokes that you could only understand if you were there. But overall, my first time across the border was pretty awesome and I wouldn’t have wanted to spend it with anyone else.